An interesting glimpse into the underbelly of the back hills near North Braddock. Christian Bale’s demeanor and general character, leaves you hoping for the best. The relationship between his character and Zoe Saldana’s is complicated and moving. Casey Afflecks portrayal of a much affected war veteran is played quite well, and mixes fluidly with Woody Harrelsons crazy back woods “good ol’ boy character. The detail in the scenes and the Actors dedication to their roles is captivating. The plot while not incredibly fast moving, is a gripping tail of a good man reacting to tragic life events. It was not the action packed “shoot ‘em up” movie that was expected, it was much better. A seemingly simple man with simple goals, handling real situations in a very real way. It is more of an actual depiction of man, than the average Hollywood portrayal of a story. Disclosure: All opinions are my own. 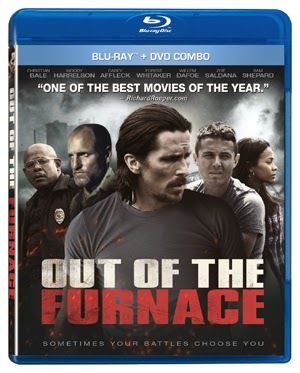 I received Out of the Furnace DVD/Blu-ray combo at no cost for the purpose of this review. No other compensation was received.